The U.S. Department of Justice (DOJ) filed a motion for continuance on January 20, asking the court to continue a hearing that had been set for January 24 for at least 30 more days. The plaintiffs who sued to set aside the Texas voter identification law, opposed the motion. The United States seeks to continue this hearing because of the federal government’s change in administration, which took place on January 20, 2017. Because of the change in administration, the Department of Justice also experienced a transition in leadership. The United States requires additional time to brief the new leadership of the Department on this case and the issues to be addressed at that hearing before making any representations to the Court. The lawyers for the Voting Section of the Civil Rights Division asked the judge to postpone the hearing until February 24 or thereafter. Magistrate Judge Jason Libby granted the motion during a telephone conference on Friday afternoon and agreed to put off the hearing for more than 30 days, reported Politico. As reported by Breitbart Texas in October 2014, United States District Court Judge Nelva Gonzalez Ramos, who serves in the Corpus Christi Division of the United States District Courts for the Southern District of Texas, issued a permanent injunction requiring Texas to return to enforcing the in-person voter identification requirements that existed before Senate Bill 14 was initially enforced in 2013. The Obama appointee had held that the Texas photo voter ID law violated the Voting Rights Act of 1965 because it: had an impermissible discriminatory effect, including deliberate discrimination against blacks and Hispanics; violated the Equal Protection Clause; and unconstitutionally offended voting rights guaranteed under the Fifteenth Amendment. She also ruled that the voter ID law was an unconstitutional poll tax prohibited by the Twenty-Fourth Amendment because the law provided for a fee for issuing copies of birth certificates or other information needed to obtain an acceptable ID. SB 14 was signed into law in 2011 by then-Governor Rick Perry. In July 2016, the U.S. Court of Appeals for the Fifth Circuit sitting en banc found that Texas’ voter ID law had a discriminatory effect under the Voting Rights Act but reversed the district court’s finding of discriminatory intent, as reported by Breitbart Texas. The 9-6 ruling held that the law did not constitute a poll tax but ruled that the lower court must put an “interim remedy” in place to mitigate the “discriminatory effects” in time for the 2016 Election. The Fifth Circuit warned that the district judge should “ensure that any remedy acted ameliorates SB 14’s discriminatory effect while respecting the Legislature’s stated objective to safeguard the integrity of elections by requiring more secure forms of voter identification.” The appellate court remanded the case to the district court to later determine if the voter ID provisions were written to be intentionally discriminatory. Texas Governor Greg Abbott released the following statement right after the decision, “The 5th Circuit rightly reversed the lower court’s finding of discriminatory purpose, but wrongly concluded the law had a discriminatory effect. Voter fraud is real, and it undermines the integrity of the election process.” Texas Attorney General Ken Paxton and the Office of the Attorney General represents the State of Texas in the lawsuit. 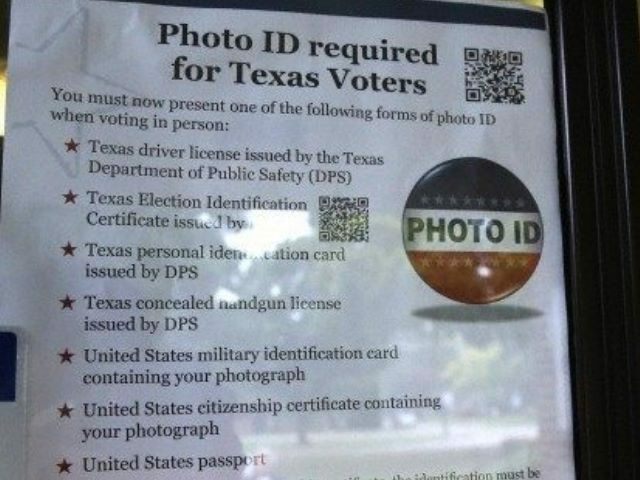 The seven acceptable forms of photo ID under the law include the following: a Texas driver’s license; free Texas election identification card (EIC); Texas personal identification card; Texas license to carry a concealed handgun; U.S. military identification card; U.S. citizenship certificate; and a U.S. passport.